Great place to visit just over the Spey from Kingussie. The barracks you see were built in 1719 after the Jacobite rising in 1715, and then destroyed by the Jacobites after their defeat at Culloden. The first castle that was built on this site in 1229, it was used as a base by Alexander Stewart, Earl of Buchan, the youngest son of King Robert the second of Scotland. 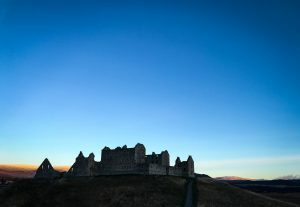 The Ruthven Barracks are open all year and are free to visit.